Apple introduced depth photography to iOS last year with the iPhone 7 Plus’s Portrait Mode. This new camera feature brought professional-like photography to the masses, and spawned several memorable ads that demonstrated just how far smartphone cameras have come. In iOS 11, Apple upgraded Portrait Mode with several enhancements, such as much-improved low light performance and optical image stabilization. But one of the more exciting updates is that developers can now tinker with Portrait Mode photos via the new Depth API. Thanks to that new API, Slør was born. Slør contains a very simple, one-screen interface that lets you get straight to work editing your Portrait Mode photos. There are three adjustment tools at your disposal for modifying an existing depth effect: Aperture, Radial, and Tilt. These allow you to adjust how much out-of-focus blur is present, select the image’s focus point, adjust the focal plane, and more. You can also preview depth information by using 3D Touch on an image at any time. 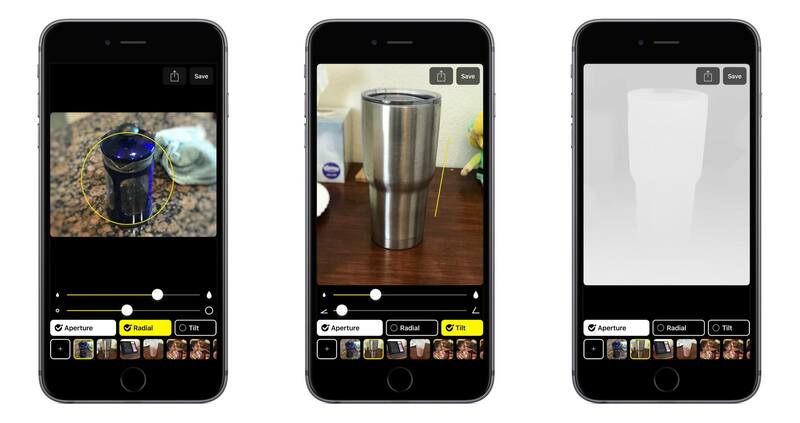 All of these tools can even be used from Photos without opening the full app, thanks to Slør’s photo editing extension. When you’re done editing, you can hit the Save button to save changes to the original image in your library, or hit the share icon to save a copy or select from any other share option. Slør’s simplicity makes it an intuitive, accessible way for casual photographers to play around and tweak Portrait photos to make them look best. I must warn you though: if you have an iPhone 7 or newer, then like me you may get distracted by the pleasant haptic feedback Slør invokes when adjusting sliders. It’s a delightful touch that I’ve spent way too much time testing. Slør is available for iPhone on the App Store.